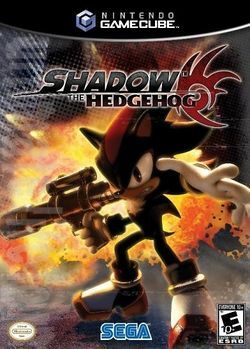 Shadow the Hedgehog is a video game starring an anti-hero of the Sonic the Hedgehog series, Shadow the Hedgehog. It was revealed at Sonic's inauguration into the Walk of Game, developed by Sega Studios USA (formerly known as Sonic Team USA), and was released in the United States on 15 November 2005. The game's most well-known tagline is; "Hero or villain? You decide." Others include "Who do you fight when you don't know what you're fighting for? "; "Will he be good? Or evil? No one knows but you"; and "This time... Evil will face Evil!". Shadow the Hedgehog was the first Sonic game to have an E10+ rating by the ESRB. It is also the first post-Sonic Adventure game to not feature the word "Sonic" in the title. This was one of the most controversial Sonic games to date, as it features guns and a significant amount of cursing.